Let's take a look at what you need to know about the estate tax on stock and dividends, including who needs to worry about this issue and what strategies can be utilized to minimize the tax bill. The estate tax is "a tax on your right to transfer property at your death," according to the Internal Revenue Service. When you pass on your assets to someone, the government wants to potentially take a cut of the value of your estate. An estate represents everything you own or have an interest in, including dividend stocks and all other publicly traded securities, cash, annuities, real estate, life insurance, and more. The fair market value of each item is used to calculate an estate's gross value. Fortunately, very few people have to pay federal estate taxes thanks to the lifetime exclusion rule. This rule allows every individual and married couple to inherit a certain amount that is not subject to the 40% federal estate tax. Before tax reform this exclusion amount was $5.6 million per person or $11.2 million per couple. However, tax reform significantly increased this amount. Between 2019 and 2025, individuals and couples will be able to inherit up to $11.4 million and $22.8 million, respectively, tax free. 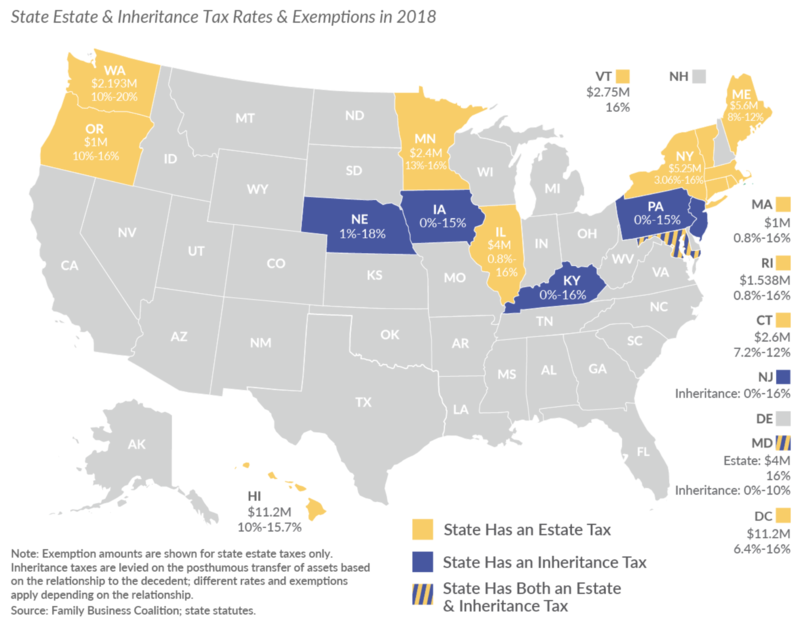 Currently 17 states and the District of Columbia have some form of estate or inheritance tax. Like with the federal government, you only pay taxes on estate values above each state's exclusion limit. Importantly, a decedent's estate can claim an income distribution deduction for distributions it makes to the estate's beneficiaries. If an estate paid out all of the dividends it earned to its beneficiaries, for example, the beneficiaries would receive a K-1 stating their share of the income that they must include on their personal tax returns. Once the beneficiaries receive the estate's assets, the estate is terminated and the beneficiaries are responsible for any taxes on income the assets generate. Now that we have a broad idea of how estate taxes work, let's take a look at the most important things most people need to know about how inherited stocks and dividend-paying investments work. The good news is that when it comes to inheriting investments, including stocks, bonds, and mutual funds, there is something called the "step up" rule that helps reduce the tax burden on long-term investments. Note that the long-term capital gains tax rate is usually much lower than either marginal income tax rates, or federal estate taxes. Here's an example to see how investment inheritance works under the step up rule. Under current tax law your cost basis on these inherited shares would have "stepped up" from $10,000 to $40,000 because that was their fair market value on the date the person died. Note that for people with very large estate there is a tax rule that allows the cost basis step up to be pushed back up to six months after the date of the person's death. If the investment appreciates significantly over this time, then the tax savings become greater. The step up rule was created by Congress to make paying taxes after inheritance easier. That's because calculating the adjusted cost basis of shares bought decades ago, and potentially affected by dividend reinvestment plans, can be extremely difficult or even impossible if the data isn't available. While the step up rule is a great benefit for most inheritors, there are two important issues to keep in mind. Second, the rule only applies to assets (stocks, bonds, mutual funds, property) that was legally part of an estate. It doesn't cover investments that were gifted to you or held in a grantor retained annuity trust that hadn't expired by the time of the person's death. For investments that you receive as gifts, your cost basis will match the cost basis of the person who originally bought them. Besides gifts, you can reduce the value of your estate and avoid taxes on any money you pay for an individual's qualified expenses for tuition or medical bills. The catch is that you must make these payments directly to the educational institution or medical provider, not to the individual receiving the benefit. There's also something called a grantor retained annuity trust, or GRAT. This is an irrevocable trust that allows wealthy individuals to pass on potentially large amounts of money to future heirs above the annual tax free gift contribution limits. The way it works is that you contribute certain assets to a GRAT that is locked up for a fixed amount of years. You retain the right to receive the original value of the asset back, plus a certain rate of return based on the IRS's Rule 7520 (typically about 3% per year). When the GRAT expires you get back your original asset value plus allowed returns, and the remainder then goes to your beneficiaries tax free. Estate planning is challenging, especially thanks to the complexity of our tax code. Fortunately most people's estates won't be affected by federal estate taxes due to incredibly high exclusion limits. If you are concerned about your heirs facing large inheritance taxes, then it's well worth sitting down with a fee-based fiduciary financial advisor to go over your estate's potential tax bill. They can help you map out a plan to potentially minimize estate taxes and account for the current higher federal exclusion limit that runs through 2025 by making annual gifts to future beneficiaries, covering qualified education and medical expenses for others, setting up a grantor retained annuity trust, and considering charitable donations.